The Outer Banks is an outdoor playground. And The Eco-Adventure Challenge itinerary is perfectly named and perfectly designed to put you right in the middle of all the action. That means kayaking, hiking, birding, sightseeing and even a wolf safari. 8:00am Breakfast at your hotel or visit one of our locally owned family restaurants and savor a good ole southern breakfast. 9:30am Kayaking in the Alligator River National Wildlife Refuge (2 1/2 hours). 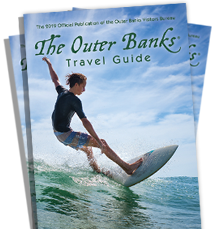 This kayaking tour takes you to one of the most pristine areas on the Outer Banks. Home to alligators, black bear, bobcats, red wolves, beaver, and much more, you will explore the waterways surrounding a once thriving lumber town and moonshine outpost. This area was known to the Algonquin Indians as a Pocosin, meaning "swamp on a hill". Fall foliage will provide you with a glimpse deep into this unique area. Truly out of the ordinary. A camera is a must. 12:30pm Lunch on the waterfront in downtown Manteo. Choose from several cafés or sandwich shops to unwind after your kayaking trip. 2:00pm Elizabethan Gardens (1 hour). Stroll through the majestic gardens, which were designed as a living memorial to Queen Elizabeth and the Lost Colony. The gardens feature a sunken floral garden and herb, wildflower and rose gardens that surround priceless pieces of antique statuary. 3:30pm Back to the hotel for relaxation, stroll the beach and look for beach glass or unique shells. 6:00pm For dinner, be sure to choose from one of our locally owned restaurants, which feature North Carolina Seafood. 8:00pm Red Wolf Howling Safari (1 1/2 hours). The Alligator Wildlife Refuge offers you the experience of a lifetime! Come and learn about the red wolves and participate in the “howling." 7:30am Breakfast at your hotel or visit one of our local owned family restaurants and savor a good ole southern breakfast. 8:30am Jockey’s Ridge State Park (11/2 hrs). View the tallest living sand dunes on the East Coast. Learn how these shifting sands move with the wind at the visitor’s center/museum. There are three self- guided trails in the park that discuss the 3 ecosystems of Jockey’s Ridge. 10:00am Hang gliding at Jockey’s Ridge (3 hours, includes ground class). Dune Hang Gliding lessons are conducted at the Kitty Hawk Kites training facility. The dunes provide the perfect platform for learning to Hang Glide. They have plenty of height for beginners and are soft for landing. 1:30pm Picnic lunch at Jockey’s Ridge State Park, have boxed lunches delivered to the park. 3:00pm Pea Island National Wildlife Refuge (2 hours). Located on the northernmost section of the Cape Hatteras National Seashore, this 6,000-acre refuge is a one of the prime birding areas on the East Coast. A haven for more than 265 species of birds such as Canadian geese, snow geese and 25 species of duck during the winter can be seen. Bird walks and other programs may be arranged in advance. 6:30pm For dinner, be sure to choose from one of our locally owned restaurants, which feature North Carolina Seafood.